Next up in the series of illustrations I have been blessed to work on with REI is an illustration for the "End of Season" sale. This piece was special to me as a father because I couldn't help but reflect on the adventures I've had with my kids while imagining the ones we'll have in the future. I really wanted to capture a sense of wonder and awe in this piece as the legacy of adventure is passed from one generation to the next. These days, I do all my sketches digitally using the iPad Pro + Apple Pencil in a wonderful app called Procreate. This app allows me to focus purely on generating ideas and usable sketches I can send to clients for approval. My first step is to generate a handful of thumbnail sketches (very small sketches I can do in minutes) to lock down the general direction, composition, and movement of a piece. Once I've sufficiently explored the digital page, I select the strongest composition, enlarge it, and begin working out more of the details. Procreate is exceptional for this use... I think back to days where I used to do thumbnail sketches on paper, scan them, enlarge them in Photoshop, redraw them digitally, etc. It took quite some time! With Procreate, I skip a lot of the stuff that really wasn't adding any value to the piece (time spent on sketches is great, time spent scanning feels like a waste). When the sketch has been approved by the client, its time to paint. I'm such a big fan of black and white as a color scheme that I do the majority of my painting using just those values. Its been my experience that if you can make a piece work in black and white, you have a better chance of making it work in color (assuming you carry over your values correctly). Where can I simplify shapes? Where did I leave my coffee cup? Should I use angles or curves? Can I add in more atmosphere? Where can I infuse detail to generate areas of focus and interest? When can I have more coffee? Once all the decisions have been made, I eventually hit a point where I look up and realize the piece is ready for color. I honestly have no idea how I know when something is done other than to say it just is. Everything I wanted to address has been addressed and I can feel the finish has arrived. Choosing color is a process where I consider what the client has asked for (time of day) in conjunction with finding colors which bring out the right feeling of a piece. I am acutely aware of the feeling I want to elicit with these pieces and I do my best to bring that feeling forward with my color choices. I'm not always concerned with what color is right, I'm concerned with what color feels right. 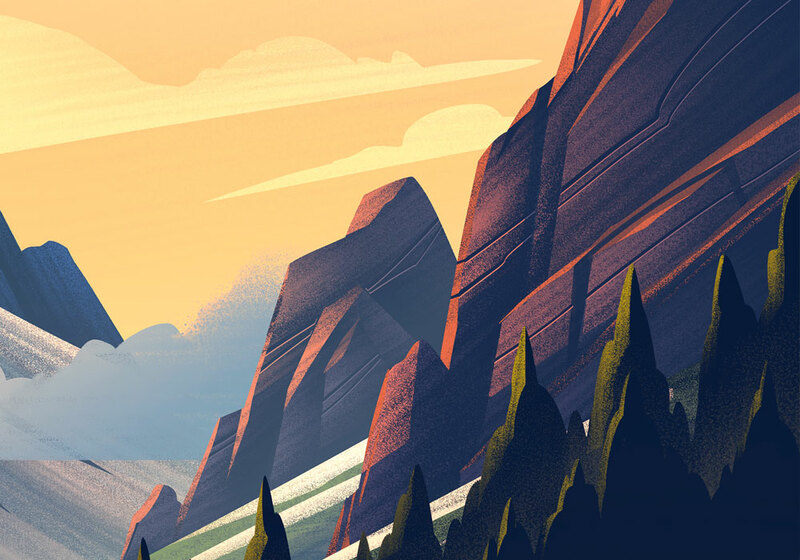 Big thanks to the fine folks at REI for giving me the opportunity to create for them! Its such a fun series to contribute to and I'm very thankful for it. I'm also thankful for the tireless efforts of my agent, Deborah Wolfe, and her talented staff for all their help. It means the world to me! Now let's get outside and chase that sunrise!